Lol, I missed this one. Really good job. Very Nice. Creepy, Dark ... Alucard. Very Helsing. one of the best hellsing wallpapers ive seen in a long time, mainly due to its lack of grunge and sophistication, well done. this hellsing wallpaper is definitly one of the most beautiful, the background fits so well with the other elements...........very great work. :nya: The Evil that drinks blood, Lord Arucard, The one and only mster of darkness, what can I say of this wall :\ ? Well Hellsing is from my favorites series so This wall absolutely defines the "Hellsing Feeling" So Keep up the good work!!! ooooo man this has gotta be the coolest hellsing wallie i`ve seen up to date!!! 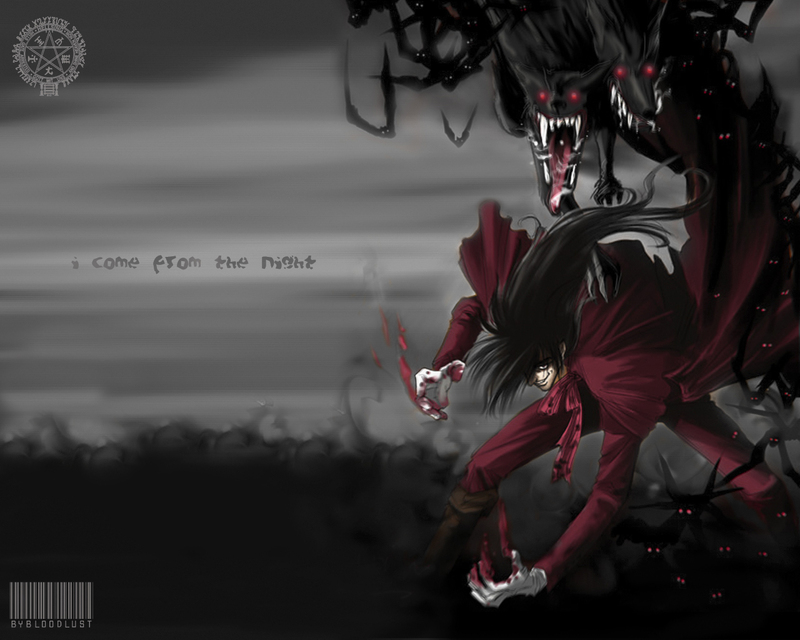 This is a great Hellsing wallpaper. The first wallpaper of Alucard I've seen when he's making those dog demon things.